There’s a war on buttons. No, not the clothing kind; bulging American waistlines are the biggest threat they face. This war is against buttons of the electronic variety, those tireless servants that dot elevators, cell phones, car dashboards and control panels the world around. They’re the perfect antidote to the baffling binary of a switch. One button, one function, press here to power/submit/self-destruct. Simple Yes. Elegant Apparently not. Or at least that’s the thinking at Apple, who released an update to their iPod Shuffle line on March 11 that’s completely devoid of buttons. It shouldn’t be surprising  if the offensive against buttons has a four-star general, it’s Steve Jobs. He and his Apple army have stripped buttons from iPhones, iPods and MacBooks all in the name of their clean, sleek aesthetic. Apple  trendsetter extraordinaire  has put the button on notice. If this trend continues, the button stands to go the way of the crank or dial: uncouth, uncool, unloved, unremembered. It’s tough to figure the exact moment when the button stopped tickling America’s fancy. It wasn’t during the Cold War: the giant red button was all that kept us from nuclear Armageddon. And in the age of the personal computer, the button was king. Mice, monitors, keyboards  buttons became a part of the fabric of our new, digital life. But maybe, on some subconscious level, we never wanted the damn thing, as evidenced by popular culture’s button-free futures. In sci-fi thrillers like Minority Report, computers are flat, seamless digital panels, controlled with an effortless swipe of the hand or the twist of a finger. But that’s just Hollywood whimsy  the button wouldn’t be in serious trouble today without the pernicious crusade of Steve Jobs. The new iPod Shuffle is just the latest salvo in an ongoing battle, dating back to Apple’s early days. For nearly a decade, Apple’s mouse famously included just a single button . After years of complaints from users, Apple released a new “Mighty Mouse” in 2005 that still featured just a single button, although the design incorporated technology that allowed the mouse to detect clicks in different directions. This was deemed more acceptable  or at least less blasphemous  than just adding a second button. And that’s just a simple mouse: Apple has waged similar battles with each of its product lines. 2000’s G4 Cube desktop computer was released with a touch-sensitive area to turn on the computer, eschewing the power button. The latest MacBook laptops remove buttons from the trackpad entirely; users click either with a tap of the finger or by pressing the entire trackpad down. The first iPod had five buttons; the current iPod Touch and iPhone have just two. Apple’s even expanding the battlefield to its stores  the elevator in the Tokyo Apple Store has no buttons; it simply stops on every floor. Critics argue that Apple’s war against buttons is an example of their value of form over function. The new iPod Shuffle design certainly hasn’t won universal praise, with some calling the design changes “needless.” But astute observers notice that the Shuffle isn’t entirely buttonless. They’ve simply been moved to a new set of Apple proprietary headphones, required to use the device. 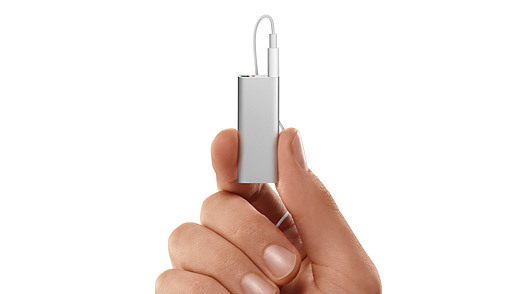 Users wanting to use their own existing headphones will have to purchase a special adapter cable. If Apple didn’t have such a vindictive history against buttons, it would be easy to write off the new “buttonless” Shuffle as a marketing ploy. Still, new Shuffle aside, the button’s days may be numbered. Touchscreen and tablet PCs are becoming more popular, and the latest generation of cellphones like the iPhone incorporate gestures and on-screen keyboards. Microsoft is touting its next-generation Surface technology, bringing the day of the massive Bond-esque touchscreen ever closer. The button may be on its last legs, but may I offer one humble request: Please, leave them in elevators. Making 23 separate stops on the way up to work isn’t my idea of a gleaming future, Mr. Jobs. The original version of this article misidentified the iPod Shuffle as the iPod Nano.